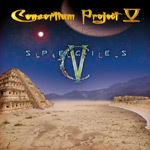 According to the press material, V - Species is the final installment of vocalist Ian Parry's (Eledgy, Ayreon, Infinity Overture, et al) Consortium Project. From the most cursory of listens, Parry seems to intend to go out with a grand bombastic finish. If anything, V - Species is heavy and relentless throughout, this is power metal on a double dose of Barry Bonds steroids. Even when there are keyboards or otherwise symphonic nuances as on Origins of Mankind, To the Earth and Back, or Pitch Black, they only make every song more weighty and bombastic. Parry also introduces new vocalists Lene Petersen and Ani Lozanova for this work. You would think this female vocal addition would offer some contrast to Parry's heavy-handed vocal character or lighten the heaviness of the music, but not so. For example, Silence Calling seems to offer some reprieve at the beginning, but the hefty metal quickly returns. Species gets closer, offering, for this work, an unusual mix of heavy, power, and gothic metal (and it's actually one of the best songs on the entire album). Oracle is similar, but with less of the gothic vibe and more of that soaring epic metal motif. Yet, and overall, Consortium Project's V - Species can only be described as thoroughly powerful and epic metal, but also stifling in its grandiose and relentless heaviness. In combination, they will be likely cause an instant hard on for the fan of heavy melodic power metal. Note: for the conclusion of the Consortium Project, Lion Music will be re-releasing the first four albums. Consortium Project's V - Species can only be described as thoroughly powerful and epic metal, but also stifling in its grandiose and relentless heaviness. Certainly a fitting conclusion to Ian Parry's significant project.